Does supplementing cows with phosphorus during pregnancy change weaner performance? Phosphorus (P) often restricts beef production in northern Australia. When an animal’s P demand cannot be met either from the diet or by mobilising body reserves, dietary intake and growth are typically dramatically reduced. Therefore, it is currently recommended that heifers and cows grazing low P areas be supplemented during late pregnancy and while lactating. 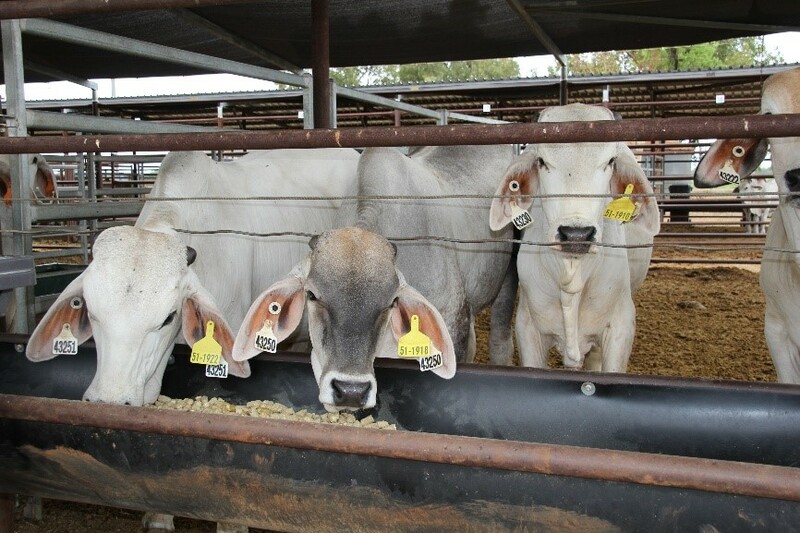 A trial currently running on Victoria River Research Station (Kidman Springs) in the Northern Territory (NT) has reported substantial reproduction and productivity gains from P supplementation. Work by Rob Dixon and colleagues show that pre-weaning calf growth is also constrained when cows are on low P diets during late pregnancy and lactation. 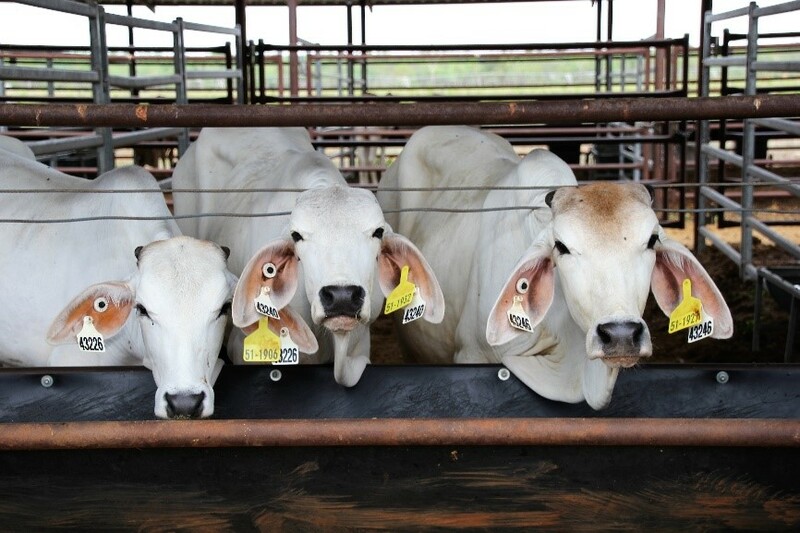 To investigate post-weaning performance, a pen study was recently conducted at the Katherine Research Station, NT, measuring the effect of P supplementation with cows during pregnancy and lactation on weaner weight and on weaner growth when fed high and low P content diets. Four year old Brahman cows grazing P deficient paddocks on Kidman Springs were used to supply the trial weaners. In June 2018 forty-three calves were weaned off cows that received a P supplement during pregnancy and lactation (Cow P+) and thirty calves were weaned from cows with no P supplement (Cow P-). The weaners had unlimited access to the experimental pellet for 64 days with their changes in weight measured. Liveweight was recorded after a 15 hour curfew at the start and end of the pen experiment, with interim uncurfewed weights recorded weekly. On concluding the pen phase of the experiment (6 December 2018), the weaners were relocated to the Douglas Daly Research Farm to graze leucaena-grass pastures at a stocking rate of three animals per hectare. All animals were inoculated with the rumen bug after grazing the leucaena for about 30 days. Liveweight is recorded monthly after a 12-15 hour curfew to monitor the response of weaners. At the beginning of the experiment, weaners from P+ cows were heavier than those from P- cows, with heifers from P+ cows 6.4 kg (174.5 vs. 168.1) heavier and steers 23.9 kg (183.2 vs. 159.3) heavier, when compared to weaners from P- cows. These differences are thought to be explained by P+ cows likely to provide increased milk supply to calves, a response which is explained by increased cow body condition. While being fed in the pens, growth was associated with diet (P-/P+) with the total growth of weaners on the P+ diet in the pens 40.9 kg greater than the weaners on the P- diet (P<0.001, Figure 1). This effect was independent of cow diet. Or in other words, regardless of cow diet during pregnancy and lactation the performance of weaners was similar when fed either a high and low P diet. This finding was interesting in that despite being similar in age, the calves from P- cows were lower in liveweight at weaning and therefore didn’t appear to display any compensatory gain. It should also be noted that the growth of weaners on the P- weaner diet appeared to plateau after approximately four weeks of receiving the low P diet. Figure 1. Growth of weaners fed high and low P diets, and response on leucaena/pasture system. On average, average dietary intake of weaners fed P- weaner diet was approximately 1 kg per 100 kg liveweight less than weaners fed the P+ weaner diet (Table 1). The reduced intake of weaners on the P- weaner diet is likely to explain the difference in growth. The average daily gain of weaners fed the P- diet during the pen study was approximately 600 grams/day higher than weaners fed the P+ diet during the pen study in the first month after being relocated to the leucaena-pasture grazing system and halved the difference in total growth (ie approximately 20 kg difference). 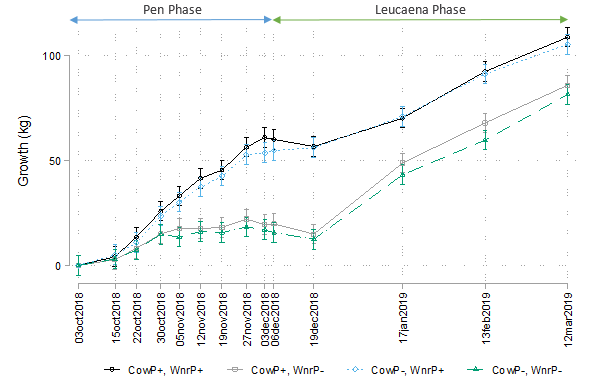 The most likely explanation for the increased growth is the expression of compensatory gain resulting from supressed intake and growth during the pen phase. The average daily gain for all groups was similar in the following two months. Throughout the trial information on changes in hip height and blood samples for measurement of Plasma Inorganic Phosphorus (PiP) have also been collected and plan to be analysed during 2019. The preliminary results suggest that the P content of cow diet during pregnancy and lactation influenced initial weaner weight, but had little or no effect on post-weaning performance. Weaner diets low in P were shown to significantly affect the post-weaning performance of young cattle. The finding from this study demonstrates the dominating effect of nutrition on weaner performance as well as the chronic impact of weight losses in calves prior to weaning.